Although many designers and illustrators have a natural eye for colour, there's science behind great colour schemes. ColorSchemer Studio is an interactive colour wheel that provides shortcuts to creating schemes, enabling you to pull palettes from images, use a colour wheel to identify harmonies, preview colours via drag and drop into several predefined layouts, and export your creations in text or image formats. Version 1 of the app was a little limited, but the new LiveScheme feature brings to mind Code Line's discontinued Color Consultant Pro, in that it enables you to pick a lead colour, then combine and experiment with various harmony types to create exciting colour schemes. Schemes can be accessed via the SchemeBrowser, which also offers several predefined schemes. New built-in colour management is another plus, and a great addition to the accessibility options, which include colour-blindness simulation and a contrast analyser. 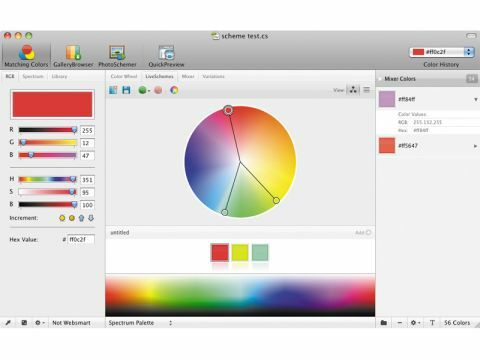 Our only real criticism of ColorSchemer Studio is that it's quite complex to use. Newcomers may feel overwhelmed by the options, and the interface isn't always intuitive. However, 30 minutes or so in, things start making sense, and you'll likely find yourself living in the LiveSchemes section anyway. Also, the app's perhaps a little pricey, but for a jobbing designer ColorSchemer Studio provides a robust, flexible toolkit for creating colour palettes, and as such comes recommended.